Globalization, new technologies, and always more heterogeneous customer structures cause increased competition and pressures in the B2B business and puts new challenges in front of the sales management. 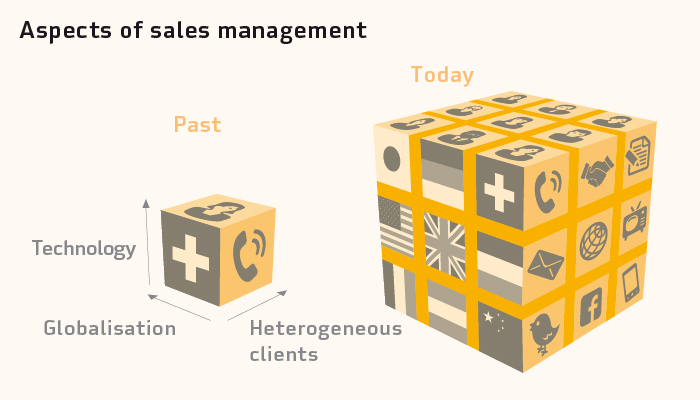 Historically “Sales” was primarily selling, but now sales management is also an analytical and strategic challenge for the corporate management. The sales management in the B2B area developed more and more in the direction of the consumer goods industry, where it is always been a part of marketing. Many companies are therefore currently also looking for new talent. Which profile does it take? The wanted executives today are those who identify trends and develop as well as implement new ideas for the company and its products. The competence to create profitable brands from products or services or to reposition them, are inseparable with the know-how, linked to an efficient sales management. Today, it requires an integrated marketing and sales approach. The first step in this direction is to shift the responsibility for the sales management to a leader that can implement an integrated approach. What profile does this leader have? Is it rather a sales veteran or a classical marketer? The ideal candidate knows the industry, has a relevant degree, is a leader and motivator, and both a sales and marketing professional. In the B2B field, it is difficult to find a leader, which is both a proven sales and marketing professional and an industry expert too. Usually there are candidates with an appropriate track record in sales, but few with relevant experience in marketing within the industry though. The reason is that until recently marketing in the B2B has still played a subordinate role and was often seen as a sales support only. But B2B marketing is out of its infancy, it offers many strategically and operationally interesting possibilities. The question is: how much marketing knowledge and how much industry knowledge is needed to take advantage of the opportunities? So the company must decide: Are you searching for a marketing professional alien to the industry? Or are you looking for an industry expert with some knowledge of marketing? No easy choice: The B2B marketing professional understands customers, analyzes needs and then bridges the gap between industry experts and the sales. He knows how the products and services have to be commercialized, in order to raise trust and preference among potential customers. He is able to manage the knowledge in such a way, that the balance between useful information and the brand message is achieved, thus making consultation and sales more efficient. He implements strategies in a way, to target and effect customer groups in a differentiated and results-oriented fashion. Yes – the marketing professional can be utilized very well across all disciplines. Interested in? Then let us talk! Are you convinced that your business needs expertise and experience in B2B marketing and sales and that a lack of marketing skills can’t be compensated by industry experience – in short, stalwart industry executives do not perfectly meet your expectations – then I am looking forward to hear from you.